Simona Halep defeats Jelena Jankovic at Australian Open: Is asked about her breasts in post-match interview. What is going on with women’s tennis coverage? As we reach the business end of the Australian Open, reporters are foot-faulting all over their Q&A sessions with the lady athletes. 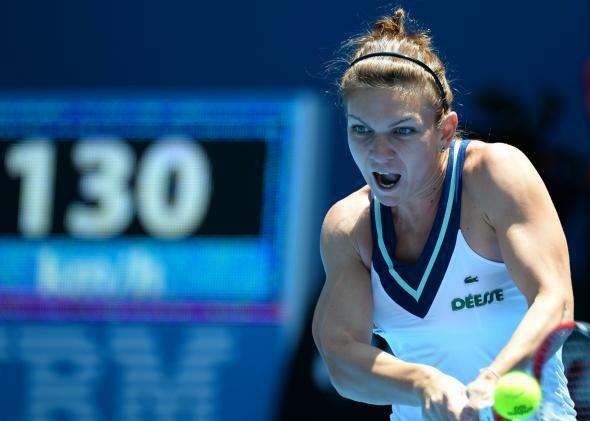 First, Romanian up-and-comer Simona Halep sat through a flapdoodle of an interview Monday after defeating formerly No. 1 ranked Jelena Jankovic to advance to the tournament’s quarterfinals. * This will be the 22-year-old star’s first time in a Grand Slam round of eight. You might think that her “potent groundstrokes” and “scrambler’s talent”—which last year propelled her to a career-high No. 11 WTA ranking—would provide plenty of fodder for a postgame media chat. But, no. After a brief back-and-forth about the “milestone win,” things quickly went downhill. Things Went Downhill Part 1: The interviewer tries to get Halep to criticize her fourth-round opponent, Jelena Jankovic. Q. Jelena ran out of challenges in the final game of the first set. Simona Halep: That game was very important for both of us. Q. She tends to do that a lot. When you’re on court with her, do you think it’s weird how often she is wrong about challenges? Do you think it’s weird how often she is wrong about challenges? I mean, not to be a total B, but isn’t it just kind of bizarre? Like, what is her deal? I cannot see like, I don’t know, the line umpires. But sometimes I see the balls, and I’m more relaxed when she ask for challenge. But I think she was very, you know, I think nervous first game to ask for two challenges already in first game. But that was, you know, my chance to get the match. Things Went Downhill Part 2: The interviewer tries to get Halep to talk about her breasts. Q. As your profile rises, people find out more about you, your breast reduction surgery was three or four years ago. Does that play any part in your success? Halep: Yeah, it was a long time ago, my breast reduction. I am happy for that. Now if I have to do again for tennis, I would do, yeah. It was a good decision for me. Q. What about outside the tennis? Halep: Outside the tennis what? Q. You said you would do it again. Halep: I don’t want to say anything about this (laughter). Aside from being infantilizing and ridiculous, this question is distinctly unenlightening. A 19-year-old Canadian woman has a crush on Justin Bieber. I could have told you that, and my tennis serve is 4 mph. Correction, Jan. 21, 2014: This post originally stated that Jelena Jankovic is ranked No. 1 by the WTA. She was formerly ranked No. 1 and is now ranked No. 8.